When we jump, when we spar, when we dance, we feel alive, connected, in the moment. In facing challenges and overcoming them we create experiences that are deeply meaningful to us. Perhaps this is why we should train, perhaps we should aim our practice at meaning! We should train to live life more fully, with the strength to bear the inevitable suffering of being and to enjoy as much of the beauty as possible. If we choose this, if we choose to train for meaning, I believe the most meaningful goal we can aim at in our practice is the cultivation of the heroic self. Movement practice is a hero’s journey. When we understand it as such we can fully harness its potential to add meaning to our lives. The fundamental hero’s journey is the confrontation with chaos, with the unknown, with the things that alarm and frighten us (Jordan Peterson 2017). It is choosing to confront the dragon, then sticking with the fight until the dragon has been defeated. We all know and love versions of the dragon story: Harry Potter and the Basilisk, Hercules and Hydra, Sigurd and Fafnir, or Bilbo and Smaug. Variants of this fundamental theme are found in mythologies the world over. The most archetypal example might be the story of St. George and the Dragon. In the time of the late Roman empire, Silene, a peaceful kingdom in the middle east, was besieged by a dragon. The residents made peace with the dragon, but at the cost of having to send a sacrificial victim—drawn by lot—to the dragon once each month. Every citizen took part in the lottery, until one day the king’s daughter was chosen, the king was devastated. He offered all his treasure and half his land to any family who would offer a child in her place, but the people refused. The princess dressed as if for her wedding, and went to the place of sacrifice. A roman soldier named George was passing by and asked her why she was so sad on her wedding day. She told him that she would be wedded to a poison-breathing dragon, and her wedding gift would be death. St. George offered to stay and defend her, but she begged him to leave and not to add his death to her own. As they spoke, the dragon arrived. George mounted his horse and charged at the dragon, wounding its shoulder with his lance. The dragon was stunned and began writhing in pain. George freed the princess, but the dragon became enraged, and forgetting its pain, charged George. George sheltered behind a rock that shielded him from the dragon’s poisonous breath, but was trapped and unable to attack. George called out to the princess to throw her girdle at the dragon. The princess quickly took off her girdle and tossed it around the dragon’s neck and, by a miracle, the dragon was tamed. When everyone else was willing to sacrifice the princess to the dragon, St. George voluntarily confronted it. When freed, the princess did not run away, but remained, and in the critical moment, struck the blow that tamed the dragon. This is what makes them heroes. So what is the dragon, and what does it have to do with movement or fitness? Our primate ancestors co-evolved with their predators, and the most important predator in our evolution was the snake (Lynn A. Isbell 2011). Fear of snakes is our most common phobia to this day and it is shared by all primates. Few snakes are big enough to actively prey on modern humans, but our ancestors were not so lucky. For most of our evolution we were perfectly sized python food. Primates have the most powerful visual systems in the animal kingdom except birds of prey and the species with the most powerful vision are those whose environments have the most snakes. As in the biblical story of Adam and Eve it is in some sense the snake that pulled the scales from our eyes. In addition to snakes our two most common predators were eagles and big cats like leopards, lions, and sabertooths (David E. Jones 2002). Throughout the primate family the most common alarm calls are those meaning snake, cat and eagle, these were some of the first words our ancestors spoke! The classic dragon figure is a snake with wings like an eagle, and claws like a leopard. We invented the dragon to symbolically represent the idea of more than just a predator, but of all predators. There were never any actual dragons, but everything represented by the dragon was out there in the wilderness ready to destroy us. The dragon story evolved as we learned to abstract out the threat represented by a single snake as part of the greater threat represented by all snakes, and further, the threat represented by all predators. The oldest dragon myth we have is that of the goddess Tiamat, who is not only the dragon, but is also the flood. We came to represent the whole domain of chaos with the dragon because the unknown and unexpected alarms us, it set us on edge and forces us to pay attention, just like the presence of a predator. The dragon then has come to represent the problem of problems. The dragon is chaos, and the hero is the man or woman who has the courage to voluntarily confront chaos and the skill to bring order from it. Mythologically, the world and our experience is represented as chaos and order. Order is the condition in which what you do results in what you expect. It’s the mundane world, the familiar, it’s what’s around the campfire. Chaos is the condition in which what you do results in the unexpected. It’s the unknown, the extraordinary, it is what is beyond the campfire. The unknown is where destructive potential lurks: predators, floods, and tribal enemies. It’s also where opportunity lies. It’s the home of our predators but also our prey. Chaos is where there are new and precious things to be found and chaos is the domain of learning and growth. As Nassim Taleb has beautiful articulated, it’s only through exposure to failure, exposure to chaos, that we become antifragile. It is only through facing dragons that we can become heroes. We tell the story of the hero and the dragon because humans thrive on the border between order and chaos. Chaos is where danger is AND where opportunity is. That’s why the dragon guards the gold! The first parkour video I ever saw spoke to me in a way that nothing before had. The message I saw in that video was you can still be a hero. Even if there are no dragons left to slay, there are dragons inside all of us: our own fear, our own weakness, our own lack of awareness, our own ego. To break a jump where death breathes down your neck is to voluntarily choose to face the dragons inside and to participate in the heroic archetype. I had practiced martial arts and gymnastics for many years, but I had never seen so clearly what inspired my training until I saw that first parkour video. After years of reading epic literature and being disenchanted with the world, I saw a pathway to a hero’s journey that would be truly meaningful to me. I have come to see all training as a hero’s journey, a path to self mastery. It’s a series of confrontations: the jump you have not done, the weight you have not lifted, the opponent you haven’t defeated. These are all expressions of the dragon. They are choices to step into the realm of chaos, into the arena of danger and opportunity. When we recognize that what we are seeking in training is the expression of our own heroic journey, it gives us the most most meaningful orientation for our practice. 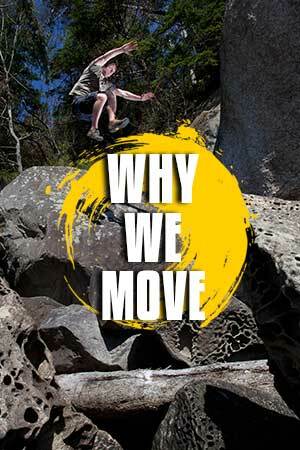 Our movement practice is a call to adventure. Once we begin, we will face challenges. We will meet fear and frustration, but if we commit to the practice, we will expand our capabilities and become a more masterful version of ourselves. The most heroic version of the self is a goal truly worth aiming at. It gives you many avenues for growth, and calls you to become a stronger person, not in any one specific way, but in general. How does one solve the problem of problems how does one training for chaos. To do this we must become generalists. We must recognize that, that this is what a human evolved for; that this is what is symbolized in our myths. I believe this impulse to the heroic is central to the rise of Natural Movement and Movement Culture and is also behind older ideas of general physical preparation. We are inspired by these ideas—by seeing athletes who are good at many things—and we aspire to be good at many things because it’s what we should be. It is what we evolved for. We exist today because our ancestors were sufficiently heroic, because a four-foot-tall ape in Africa evolved to solve the problem of the snakes, cats, and eagles that preyed on it. In so doing we became the world’s greatest generalist in movement and cognition: able to walk efficiently for miles, to run down prey in the hot sun, to use the most powerful and accurate throwing arm in all of nature to chase away predators and take down the biggest of prey, to make tools, build shelters, to run, jump, climb, swim, lift, carry, fight, and think our way into creating order out of chaos. No other animal is so behavioral flexible as a human both in movement and mind. We evolved to be that archetypal hero, but so often we train in a way completely at odds with that evolution. We are the greatest generalists in nature and yet we most often train like the most specialized of machines. In a culture that has walked so far down the pathway of reductionism and specialization it can be hard to see the big picture of movement, it’s time that step back and look at that big picture. We need to reclaim what we are. We need to train to become the most heroic version of ourselves. This is just the first in a series of articles on this topic. Next time we will be exploring the heroic archetypes reflection in the crossfit definiton of fitness, the problem of orientation and wisdom from the self defense community. If you want to dive deeper into these ideas and immerse yourself in the practice come join us for one of our upcoming events. 1. Jordan Peterson’s Maps of Meaning lecture series. Peterson’s work on archetypes is itself rooted in the work of Carl Jung and Mircea Eliade.